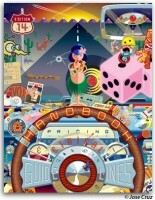 The Graphic Artists Guild Handbook: Pricing & Ethical Guidelines is considered to be the industry bible for communication design and illustration professionals. The current edition continues the tradition with new information, listings and pricing guidelines. It addresses legal rights and issues such as how copyright laws affect the income and work of graphic artists. It also provides tips on how to negotiate the best deals, pricing guidelines, and includes sample contracts. With new information, new listings and current pricing guidelines — this is the resource that addresses virtually every question. • Chapters on digital media and web design keep you current. • Guidelines on ethical and professional standards. • Negotiate the best deals with tips on how to position yourself and up-to-date pricing guidelines. • Use sample contracts so you don’t have to make up the fine print yourself, and know you’ll be covered. Members receive the printed edition of the Handbook as a benefit of membership and are also invited to attend our members-only webinars on applying the Handbook to your business. The webinar is scheduled periodically so that Guild staff can acquaint you with the wealth of information contained within the Handbook and field your questions.